Looking for a fully loaded home theater system which doesn’t put hole on your pocket? Here come the latest home theater setup from electronics giant Panasonic. The well-known electronics leader, Panasonic launched new model SC-BTT465. The model comes as a bundle of tower speakers, bookshelf speakers, HD 3D Blu-ray player and bass reflex subwoofer. On paper, the specification are outstanding for its price tag. With so many options available today, is this the best home theater system you can buy in terms of value for money? We find out in our Panasonic SC-BTT465 review. 5.1 channel 1000W powerful output with Dolby Pro Logic II support. Tall floor standing speakers, bass reflex woofers and bookshelf speaker produce amazing surround sound effects. Full HD 3D Blu-ray disc player with wireless connectivity. Operate from smartphone or full functional remote control. Multiple connectivity options including HDMI, Wireless LAN, ARC, NFC and USB. True Cinema technology and much more. Panasonic SC-BTT465 has everything to offer an amazing audio experience. The tall boy speakers not only look attractive but also offers high fidelity sound. On our rigorous testing with assorted music files, we never noticed any distortion in sound. The review unit produced very good surround sound effects with clear details. The bass reflex sub-woofers were just icing on the cake, thunders, earthquake and gun firing scenes on movies will surely make you to sit on edge of chair. The Blu-ray player which comes with SC-BTT465 has many useful features as well. Picture quality of was up to the mark for a good home cinema theater. The device even supports 2TB external hard disc through USB port, many users could find this feature very useful. We didn’t face any problem playing all common media file formats stored on USB flash drive. Another highlight feature of this model is wireless connectivity, we could easily connect and playback media files from smartphone and laptops without any hassle. We were really surprised to see the bundle of six high quality speakers and media player at this price band. 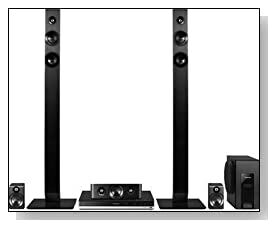 Panasonic SC-BTT465 comes with all that you need for complete home theater setup, at much affordable price. At this price tag, it is difficult not to recommend this model. Priced at less than $300, well trusted company offers top-of-the line, future ready 3D Blu-Ray disc player and six high quality powerful speakers with subwoofer. If you’re dreaming to own a high quality home theater system for a long time, it’s the time to consider buying this product.